The tradition of making and eating cakes stems from using animal products like butter, eggs, as well as gluten ingredients. 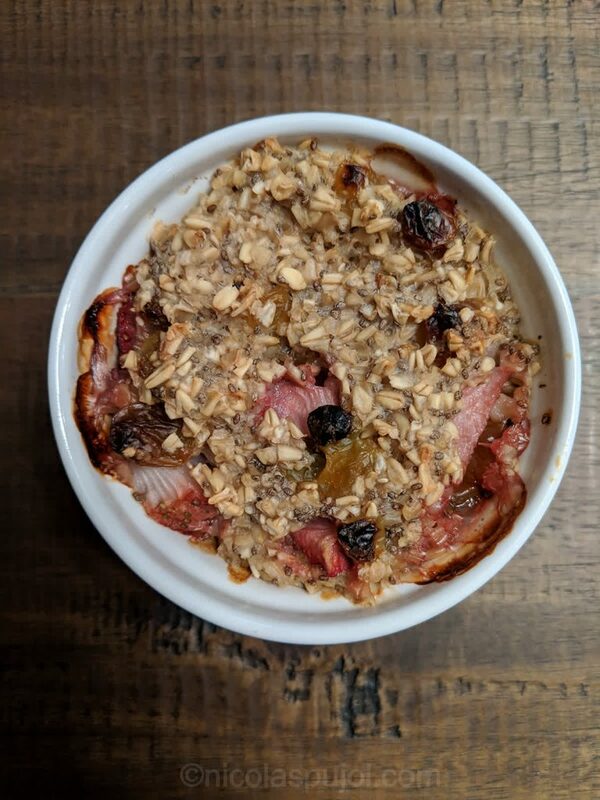 When thinking about a plant-based, low fat way of baking, baked oatmeal can provide a cake experience that meets both goals. 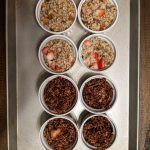 These strawberry raisin baked oatmeal cakes with chia seeds are made with fruits, vanilla extract, and optionally unsweetened cocoa powder. These cakes are unsweetened, other than the natural sweetness of raisins and fresh strawberries. 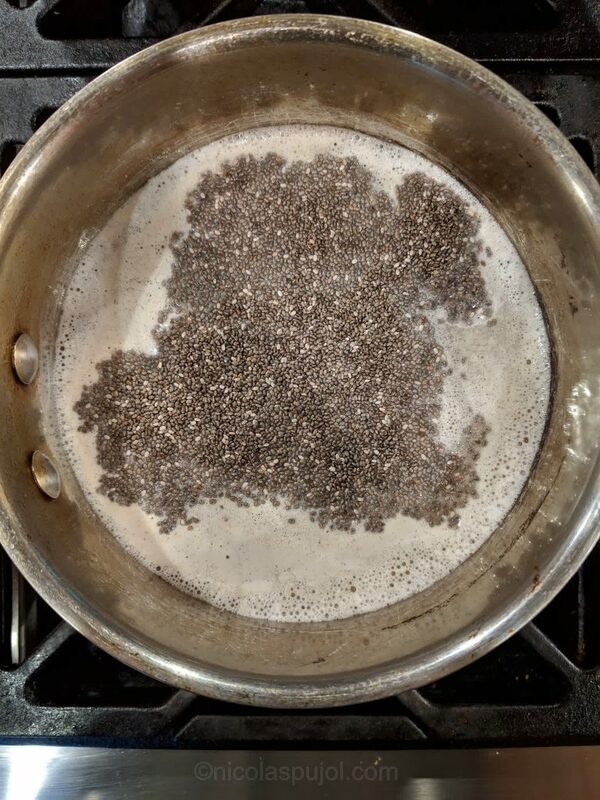 I also added omega-3’s with chia seeds, which I cooked with the oatmeal from the beginning. 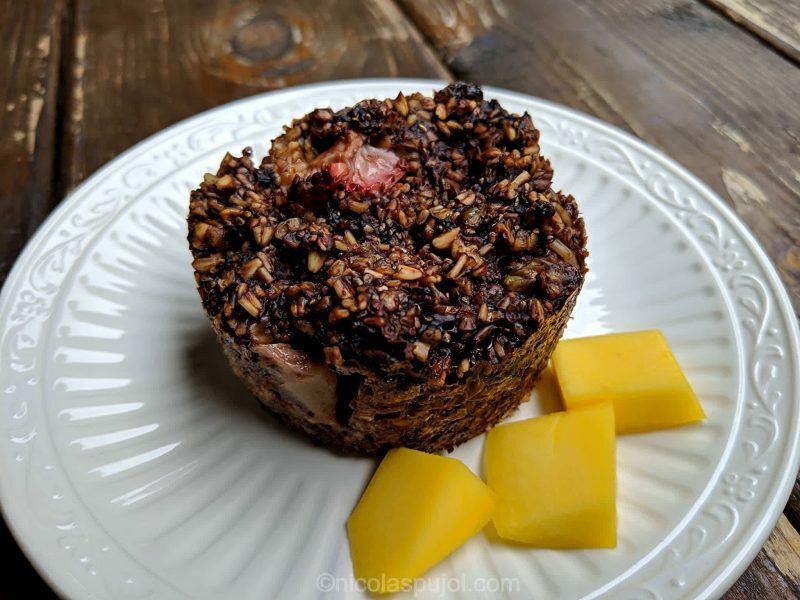 A creamier and slightly sweeter version of these cakes, I later on made these chocolate oatmeal cakes with almond milk, soy milk, and more cocoa powder. 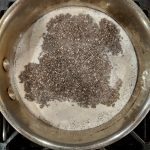 Doing so helped the chia seeds become more soft in the final result, cooking in the pan then in the oven. 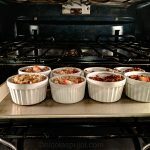 The recipe yields 8 small cakes, using ramekins. I did 4 with as initially intended. Then added unsweetened cocoa powder to the pan, mixed it in, so that the final 4 baked oatmeal cakes would have a chocolaty flavor. 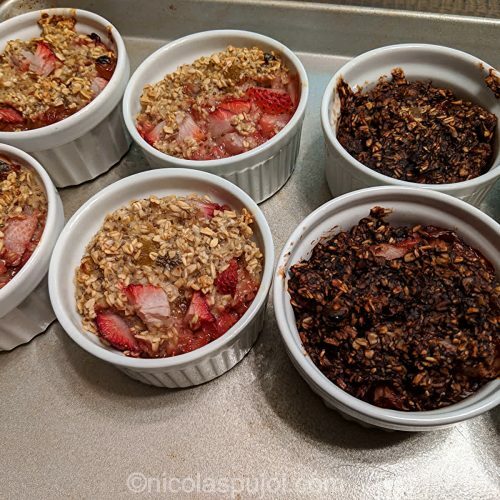 I hope you enjoy these Strawberry raisin baked oatmeal cakes with chia seeds! These strawberry raisin baked oatmeal cakes with chia seeds are made with fruits, vanilla extract, and optionally unsweetened cocoa powder. 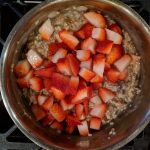 In a pan, heat the steel-cut oats and chia seeds with water, bring to boil (takes about 5 minutes) then cook on low heat for 5 minutes. 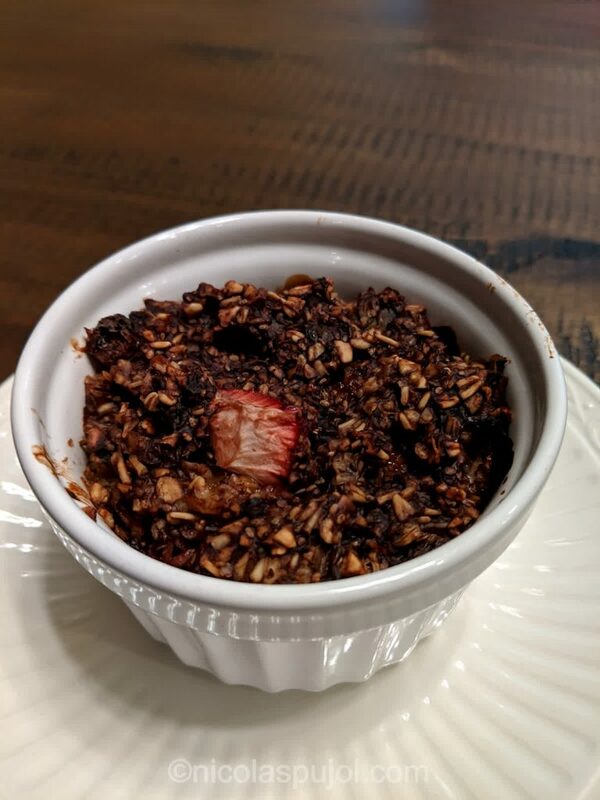 Cut the strawberries in small chunks, then add them along with raisins and vanilla extract to the pan. Stir and cook on low for another 5 minutes. 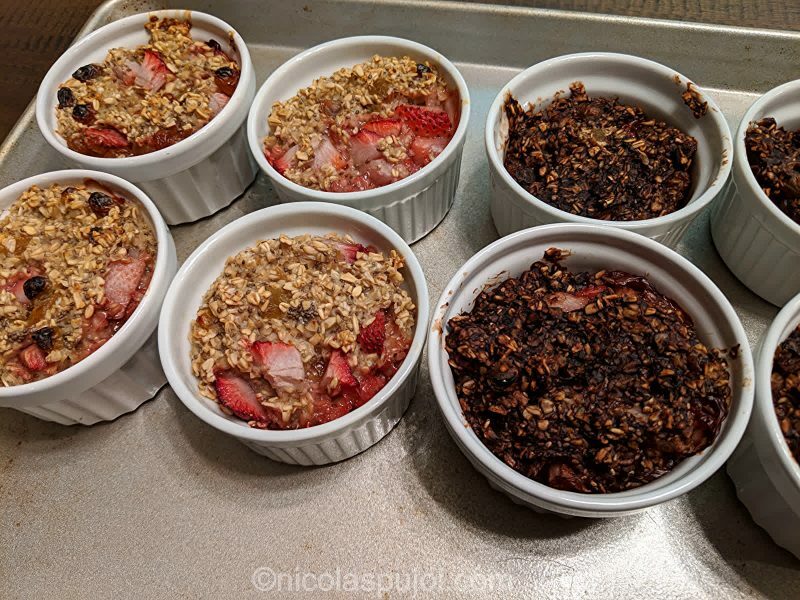 With a large spoon, pour the oatmeal mix into 4 ramekins. Add the cocoa powder, stir again, then fill the remaining 4 ramekins. 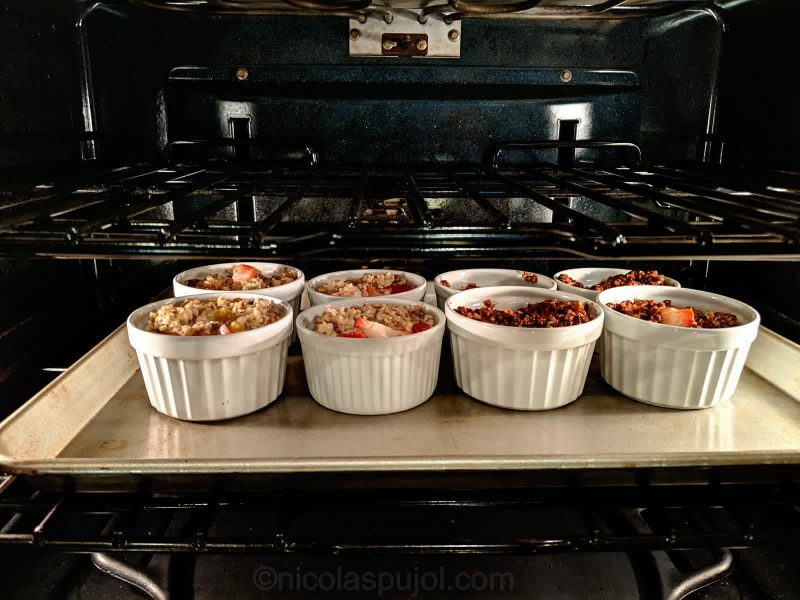 Place inside the oven and bake for 30 minutes. You can consume them immediately, but the cakes will take more shape by letting them cool down 20 to 30 minutes once out of the oven.